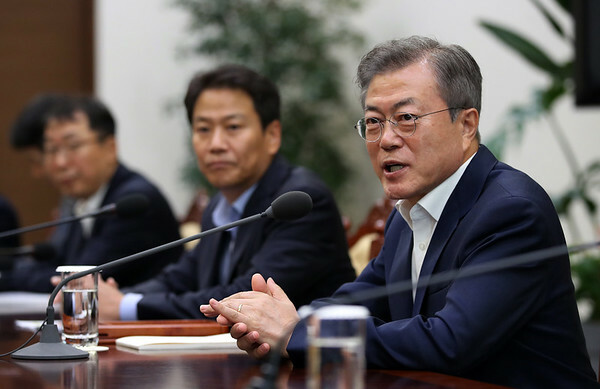 SEOUL, South Korea - South Korean President Moon Jae-in said Friday he is pushing for “irrevocable progress” in efforts to rid North Korea of its nuclear weapons by the end of this year as he prepares for his third summit with North Korean leader Kim Jong Un. Meanwhile, U.S. President Donald Trump said he was expecting to get a “positive” letter from Kim after South Korean special envoys traveled to Pyongyang this week to help resolve the nuclear stalemate and pave the way for the Sept. 18-20 Moon-Kim summit. South Korean officials say the summit in Pyongyang will focus on how to achieve denuclearization of the Korean Peninsula - the goal that Kim and Trump agreed to at their own historic face-to-face meeting in Singapore in June. Diplomatic progress since then has been slow. After returning home from North Korea, the South Korean envoys said Thursday that Kim still has faith in Trump and reaffirmed his commitment to a nuclear-free Korean Peninsula, although he expressed frustration over skepticism about his sincerity. Chief envoy Chung Eui-yong said Kim wanted to denuclearize before Trump’s current term ends in early 2021. Trump said he’s expecting to get a letter in the coming days that Kim is sending to him through Secretary of State Mike Pompeo. It was a reference to the message from Kim to Trump that South Korea said Thursday it would be forwarding to the United States. During their visit on Wednesday, the envoys had forwarded a message from Trump to Kim. Still, the next step in nuclear diplomacy is uncertain. Negotiators seem deadlocked over whether North Korea truly intends to denuclearize as it has pledged numerous times in recent months. North Korea has dismantled its nuclear and rocket engine testing sites, but U.S. officials want more serious, concrete action taken before North Korea obtains outside concessions. Posted in New Britain Herald, Nation-World on Friday, 7 September 2018 19:29. Updated: Friday, 7 September 2018 19:31.